I have Ubuntu 14.04 and Gnome 3.12 (using a dark theme) and in some applications I have now a big, white title bar. How can I remove title bar of an application? In gnome 3.10 I used gnome-shell-extension pixel saver but now this extensions is outdated. I solved this by using Maximus. # NOW OPEN AND EDIT THE OUTDATED metadata.json FILE. See link above. Welcome to the wonderful world of Gnome 3.12's forced client side decorations. CSD are hardcoded in GTK 3.12, the only way to get rid of them is to downgrade GTK to V 3.10. Gnome Shell Extension Pixel Saver just works. You have to use the Tweak Tool and change the Window Theme from there. Like alb3rtano0012 suggested, you should download Tweak Tool aka. 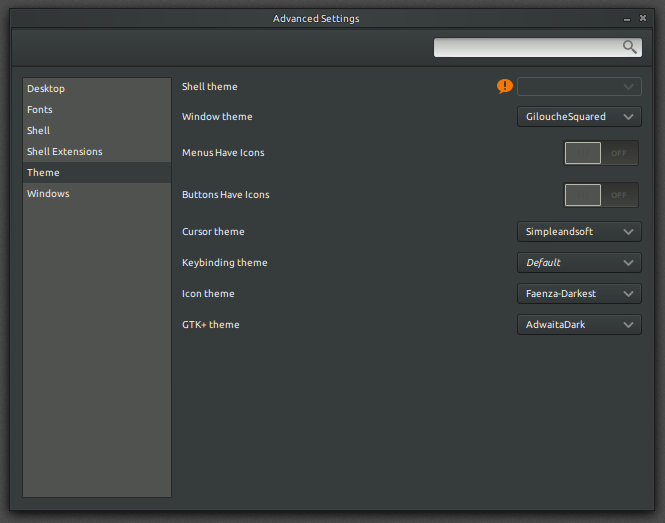 'Advanced Settings' [Tweak advanced GNOME 3 settings], that enables you to choose a different window theme, matching your overall dark GTK+theme. Type in the following command then hit Enter. Follow the steps for Method #2. Note- Method #1 is no longer maintained so it is not relevant anymore but Method #2 does still work. This is if you want to remove the titlebar completely, if you want to blend the titlebar with the theme then @v2r's solution is more applicable. Not the answer you're looking for? Browse other questions tagged gnome 14.04 or ask your own question. How to remove the title bar of a window in js/lg/extension under gnome-shell? Any Favorites/ Bookmark file plugin for Gedit 3.12 +? How do I hide/disable close buttons for GNOME windows?